Defense Minister Brownie J. Samukai has lauded the United States Government for its unwavering assistance towards the transformation of the Armed Forces of Liberia (AFL). He observed that the United States has been very supportive of the training and equipping of the over 2,000 personnel of the Liberian army, according to a Defense Ministry press release issued here Tuesday. Defense Minister Samukai made the commendation when the United States delegation to the Partnership Dialogue headed by Department of State Counselor Thomas Shannon, paid a courtesy call on him at his Barclay Training Center office on Tuesday. He also expressed gratitude to the U.S Government for the role it played in the process leading to the selection and induction of the Chief of Staff of the AFL, Brigadier General Daniel Dee Ziankhan. Minister Samukai assured the U.S State Department delegation that Liberia remains committed to fighting terrorism and other trans-border crimes within the sub-region and beyond, as mandated by the Commander-In-Chief of the AFL, President Ellen Johnson Sirleaf. Minister Samukai informed the visiting delegation that the security situation at the borders of the Mano River Union countries of Liberia, Sierra Leone, Guinea and Ivory Coast remains calm. He said the recent attack near the Liberian border with Cote d’Ivoire was an internal uprising which his Ivorian counterpart said has been put under control. For his part, Counselor Shannon thanked Minister Samukai for the good work the Ministry of Defense continues to do, including contributing troops to international peacekeeping efforts in Mali. 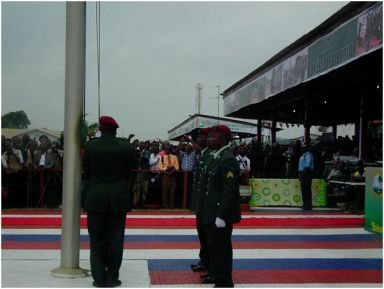 This, he noted, demonstrates that Liberia is regaining its respect within the comity of nations. Shannon said he remains proud of US-Liberia relations, and that one of the primary goals of his mission to Liberia is to hold a Partnership Dialogue with defense authorities, as well as to meet the new Chief of Staff of the AFL, Brigadier General Daniel Dee Ziankhan.